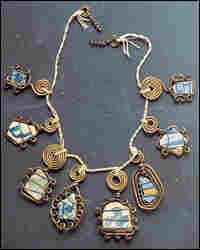 Necklace, 1930. Calder used brass wire, ceramic and string to commemorate his mother's birthday. 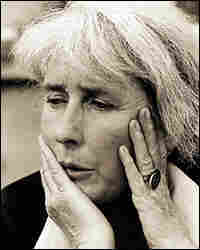 Louisa James Calder, seen wearing her wedding ring in 1964. For this 1930 gift for fellow artist Joan Miro, Calder used brass wire and ceramic. 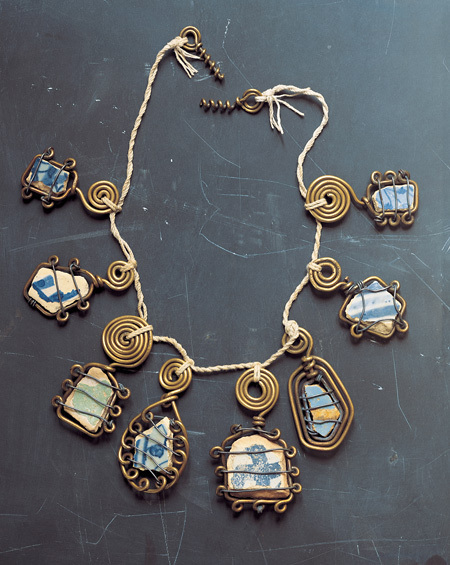 In 1930, Alexander Calder sent his mother a birthday present: a necklace, fashioned from brass wire, string and bits of broken pottery. His note said, "I have been making wire jewelry — and think I'll really do something with it, eventually." And he did. On this, the 110th anniversary of Calder's birth, an exhibition of his jewelry is on display at the Philadelphia Museum of Art. Many people have seen Calder's big stabiles in public spaces all over the world: black or bright red steel, arcing like graceful ballerinas on impossibly tiny toes. His mobiles are also popular, their floaty shapes suspended from wires to meet the breeze. Although it is less well-known, Calder's work in jewelry fits smoothly with his wider oeuvre, according to the show's curator, Elisabeth Agro. "The jewelry is not a separate thing he did," Agro said. "He did it alongside everything he did. It's another aspect of his sculpture." Agro says one reason Calder's jewelry is less familiar is that the artist made the pieces mostly for family and friends. One of them was the painter Joan Miro, who received one of Calder's rings, a hunk of yellow and blue porcelain wrapped with brass wire. "That's the kind of wire that your winter coat comes back [hanging] on from the dry cleaner," Agro said. "Seriously. That is the kind of gauge of wire that a lot of these brass pieces are made out of. It's not a beautiful wire. But, somehow, what he does with it is fantabulous. I mean, look at that." 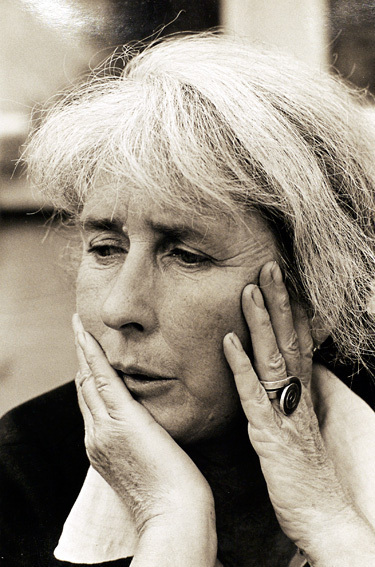 In Calder's hands, rings, necklaces, pins, earrings, bracelets — even a tiara — were crafted from brass, steel, silver and bits of old glass or crockery. "He's not a jeweler," Agro said. "There are no welds. He's working on an anvil and a bench, but he's not doing what jewelers do, not making links or soldering things. He's taking wire and doing stuff with it that no one else was doing. With basic wire." Calder hammered the wire on his anvil, flattening and broadening it into an eighth or quarter of an inch. Then he squiggled it into shapes — leaves, circles and especially spirals. "It's a potent symbol," Agro said, "one that evokes fertility. "The spiral is one of the oldest forms of ornament. You see it on caves. There's something very eternal about it. And when you put it on a wedding ring, why, there you go!" 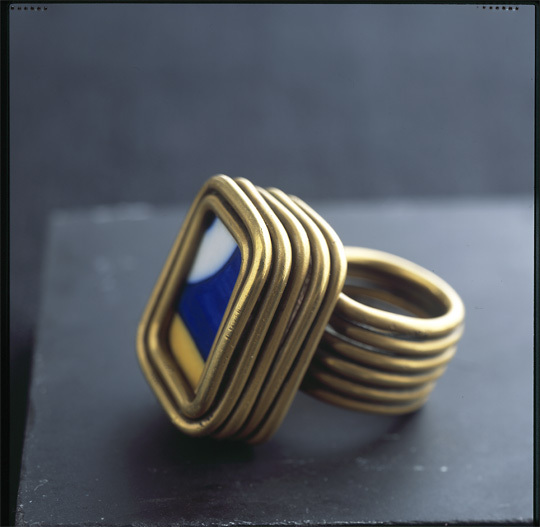 Calder made a gold spiral wedding ring for Louisa James, whom he met aboard a ship from Europe to New York in 1929. James was a well-bred Bostonian who became the bohemian Calder's wife — and also became his muse. In a letter to her mother, James described her husband, nicknamed "Sandy": "He has tremendous originality, imagination and humor." Speaking on NPR some years ago, Calder's grandson, Alexander "Sandy" Rower, remembered that humor — in the artist's personality and in his work. "People would burst out laughing." Rower said. "I was with him many times when, at an exhibition, people would walk in and just laugh. And he loved that." Alexander Calder, who lived from 1898 to 1976, liked to poke fun, too. In a clip from a 1950s TV program, an interviewer asked how the artist knew when a project was finished. "When it's dinnertime," was Calder's laughing answer. Calder began making jewelry when he was just a little boy, Agro said. His sister decided she needed jewelry for her dolls. "And Calder fashions jewelry for her out of telephone wire," Agro said. "We can all think of a moment when we were children and the telephone guy came and was repairing — I made jewelry and we all did this. "But he just kept going. He had the smarts to sort of say, 'I got something here and I'm good at this and I'm going to keep making this.' It all started then, and he just continued doing it." Calder benefited from plenty of encouragement at home. His mother was a painter; his father, Alexander Stirling Calder, was a prominent sculptor. His work includes the gorgeous Fountain of Three Rivers in Philadelphia's Logan Circle. And Calder's grandfather, Alexander Milne Calder, crafted the large statue of William Penn on top of City Hall. One of the works on display at the Philadelphia Art Museum is a necklace that flows in slim silver circles from neck to waist. The chain mail necklace, Agro said, is made from delicate material. "It's the wire that you'd use for braces. That kind of wire," she said. "And he's made very beautiful ringlets, silver circles, so that it looks like a chain mail medieval vest. "But it has a V-neck and comes down tunic-like to your midriff, most delicately. [It's] not a solid piece of wire. It's many little circles, creating the necklace." A circle is a circle is a circle. But in Alexander Calder's hands, this basic shape is reinvented every single time. No two circles are alike in this airy silver vest. Which is why Calder never wanted his jewelry to be mass-produced. He liked making the pieces one-of-a-kind, by hand. And with affection. 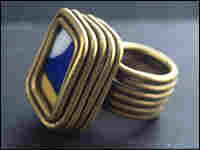 And the jewelry, Agro said, shares a characteristic of all Calder art. "Space. It's about occupying space," Agro said. "And he just sees the body as a grounding element for this other aspect of his work. Not that the body gets in the way — the body is one part of this larger work of art, when you put it on." The "Calder Jewelry" exhibition is at the Philadelphia Museum of Art until Nov. 2. It will travel to the Metropolitan Museum of Art in New York in December and then to the Irish Museum of Modern Art in Dublin. The show was organized by the Calder Foundation and the Norton Museum in West Palm Beach.